Well, I just can’t believe it. It really snowed here in New England and took out power for so many… reminiscent of our Hurricane Irene days, except it’s really cold outside this time so many are finding shelter at local hotels or with friends and family. We were one of the lucky ones and got our power back on Tuesday night. We were all very excited to get power back, as it is very difficult being in chaos during this extremely sensitive and rough time. I need as much normalcy as possible right now, whatever is considered normal at this point in our life. Well, I wanted to update you on few things that are still happening even with the snow storm. 1. NEW RETAIL LOCATION: Food Jules Organic Jams and Granola is now available for purchase at our local Purdy Hill Bakery in Monroe. The girls there are very sweet and they have included Food Jules in their space. We are very grateful to them. So now you can pick up your jam when you go buy your fresh bread or croissants. 2. FOOD WORKS: Tomorrow, November 4th, Food Jules products will launch at Food Works Natural Market in Monroe. I will be there from 9:30-11:30 or so giving out some free samples of Jam, Hot Fudge and Muffins… so stop over to visit us, get warm and enjoy free samples! 3. MASS FOR JULIAN: The Mass of Remembrance on Saturday, November 5th has been confirmed. We will be at St Jude Parish at 5:30pm thinking about our baby Julian as we approach his first birthday. Look at this picture… look at that sweet, little boy with his beautiful face and those soft hands. You can’t even imagine how much I miss him and how I would do anything, I mean anything, to have him back in my arms. My beautiful baby Julian, laying in our bed all snuggled up with his blanket. 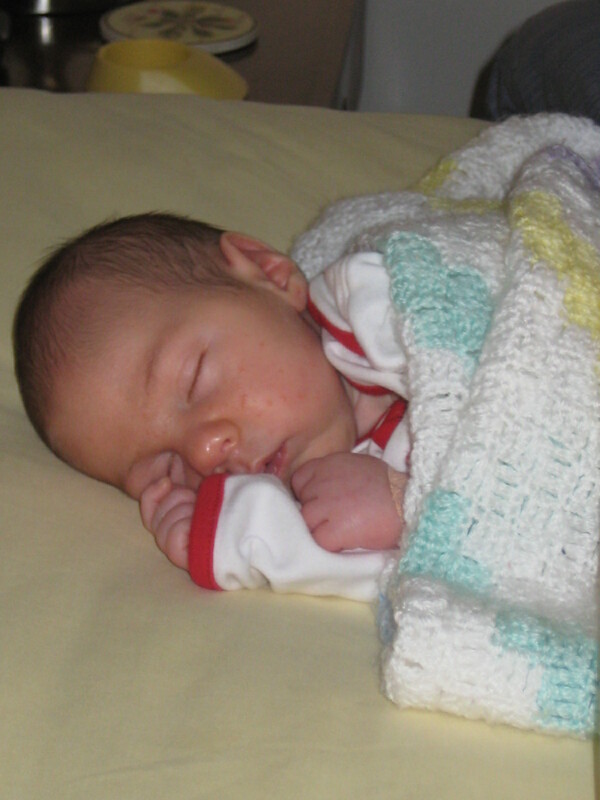 This blanket was made by my mother for Lilliana when she was a baby, but our little Julian used it every day. He loved it so much that he is still covered to this day with it, along with his favorite black and white book they gave him at Bpt Hospital and pictures and letters from us. This time last year, we were anxiously awaiting his arrival, in just a few days. Our bags were packed, our house was full of baby stuff and our mini-van with an infant car seat…. but today, all of that is gone and it is so lonely without him. I wish I could close my eyes and wake up with him in our bed again!